We think of our work as developing leaders who create workplaces that inspire the human spirit. This may not be what our corporate clients go out into the market looking to buy, but it is what attracts, builds and engages a vibrant workforce. Our business is all about empowering more effective leadership conversations. Leadership is really about relationships. A fundamental way to build better relationships is through better communication. 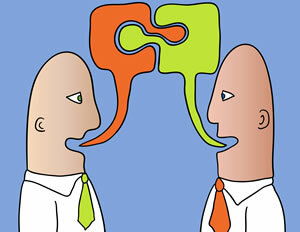 How people communicate with one another governs the success of both leadership and business. Management fads come and go, but fundamentals of good leadership don’t change over time. Effective conversations are always important. Leaders must be able to have effective conversations in order to unleash the potential of others. With a preemptive apology to the non-tool-oriented, think of leadership conversations as a ratchet handle. The beauty of a ratchet handle is that you can attach a wide variety of tools to the end of the handle and apply massive leverage. The actual force is magnified by the handle’s leverage. A little force becomes a lot of forward motion. Ratchets lock into a direction and, once force is applied, do not go backwards from the original direction of force. Conversations are the ratchet handle to which are connected the tools of leadership. How things happen in organizations is through conversations (the handle). The applications are unlimited: how ideas are developed, how influence occurs, how coaching is conducted, how alliances are formed and how team synergy develops. All happen through conversations. We equip leaders for the most effective leadership conversations possible. We’ve chosen to focus on leadership conversations because we’re convinced it’s the point of greatest leverage. We intend to develop a full suite of programs to support effective leadership conversations. As we work with participants, we are alert to the needs of the market, and are constantly developing to meet those needs. In the process of developing leaders we are also developing an international network of talented and like-minded educators. Through this network we continually test our ideas and improve our methods. Our facilitator community takes our programs and amplifies the results with their own ideas. This process feeds back into the redesign of our programs. We are in the process of exploring the use of online technologies to expand our reach and make our programs more accessible to our international clientele. Both of us (Cheryl and Brent) are global thinkers and global doers. We see online technologies as a way to reach new markets and bring together leaders across the barriers of time and distance. Wherever you are, we want to support you to LEARN, to LEAD, and to UNLEASH the potential of those around you. Now that you have an overview of Leadscape Learning, learn more about the Co-Founders, Cheryl Smith and Brent Stewart and the backgrounds they bring to their work.